Last updated 19 September 2018 . By Olivia Cheves. Greek food fanatics, if you thought you'd been spoiled enough by the likes of Hungry Donkey, Suvlaki and The Athenian then just look at what's in store for you. The new restaurant concept from the team behind Athens' two Michelin-star Funky Gourmet, PittaBun is bringing delicious stuffed pittas to Soho's Newburgh Street. Inspired by traditional Greek street food dining, the 40-cover restaurant will be cracking out some delicious combos to stuff those buns: slow-cooked lamb shoulder and feta, panko-crusted cod with beetroot ketchup, vanilla ice cream and baked apples. 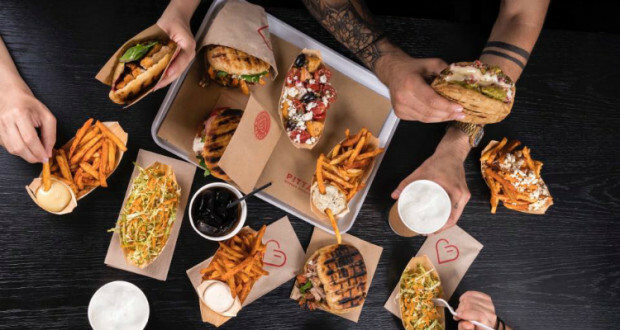 Served in a casual manner with disposable containers taking the place of plates, PittaBun is set to be a real pig-out spot with lots of hand cut chips, perfect for dipping in some creamy tzatziki, with the added bonus of craft beers and Greek wines to wash it all down with.